As an add on to my previous post about my Clara Oswald wardrobe, I made some DIY jewelry. 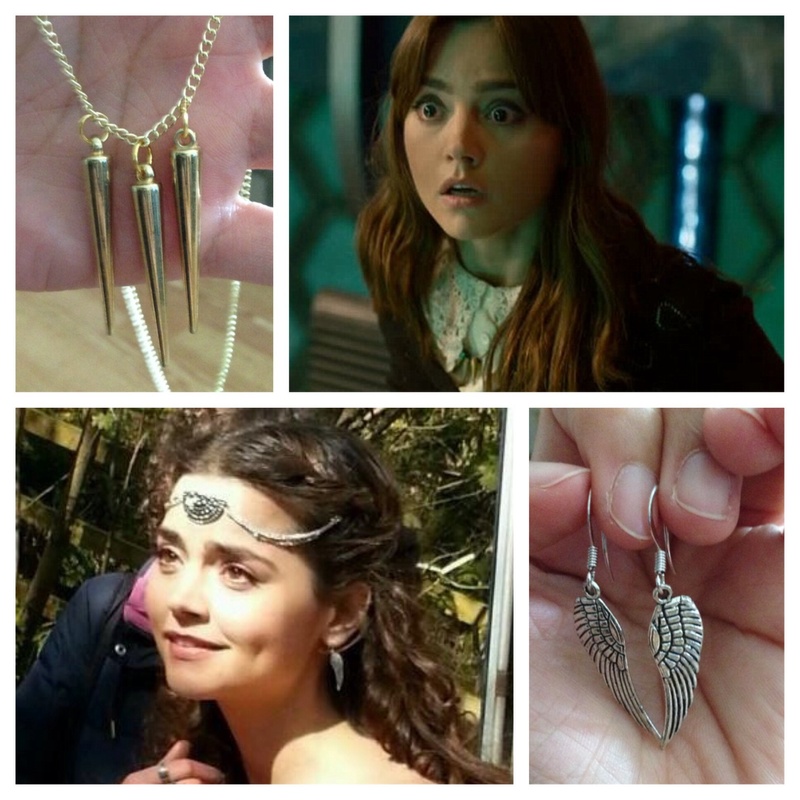 Clara wears a lot of jewelry in Doctor Who (maybe more than I am comfortable with). In any given episode, she’s wearing at least a necklace and multiple rings and/or earrings. Some jewelry I have purchased in their screen accurate or alternative form (such as her eagle necklace or Robots of Sherwood headpiece), others (like the rings) I just kind of fudge together with things that I have. A couple of pieces I was going to purchase off of Etsy but figured why don’t I try my hand at making them instead. So after a very successful trip to Michael’s today, I have cobbled together Clara’s Time of the Doctor triple con necklace and Robots of Sherwood wing earrings. The triple cone necklace is, obviously, not identical to the original. I wanted something a little “daintier” that I could wear to work; subtle but still an attention getting. The earrings are almost identical. The hooks might be different but the wings are almost spot on. I found them by chance in a set of 7 wings. I turned 4 others into earrings in the hopes another Clara cosplay might be able to use them. Not sure what I am doing with the last wing though. I do have a couple of vintage silver rings on my Etsy favorites list I might purchase to use as Clara items. They seem her style even if they aren’t the exact ones. I’m still on the search for some small twist hoops to turn into Clara’s The Snowmen earrings. They are surprisingly difficult to find. A couple of weeks ago, I made the decision to get fit. I’m at a pretty good weight and size for my height so weight loss isn’t the goal. The goal is to be toned. The vanity in the decision is that I have three superhero cosplays to make for next year’s Heroes Con. While the ladies are covered but, the fit of their clothing leaves little to the imagination. Plus, I want to look the part of a superhero. I started the new plan 4 days ago. I had to wait because I had minor back surgery to remove some epidermal cysts and the stitches needed time to heal. My plan is simple: eat healthier, drink more water, work out every day. I started a train for a 5k running program and have also incorporated visual workouts by Neila Rey on days I can’t run. To make sure I stay motivated, I am keeping a blog entitled Team Sparklefists where I am documenting what it is I am doing weekly, how well or not so well I am achieving my goals, and also talking comics. So far I have been mostly successful, which I’m very happy about. My tummy has slimmed down a bit and I can feel my legs growing stronger. Gotta work the arms and back but the scars from the surgery need another 2-3 months to heal before they withstand anything substantial. In starting this new workout, I find myself lacking in clothing. I have two pairs of skort capris (capris with skirts attached), one pair of yoga capris, a skirt cover up, one short sleeved shirt, and one tank top. THAT’S IT. While I can get by with the capris, my tops need work. But I can’t spare the money to buy tops because work out gear is expensive. Even the $20 it takes to by regular tank tops is making me cringe. So I scoured my closet and found two tees – one too big and one too small. I decided to make them into tank tops. 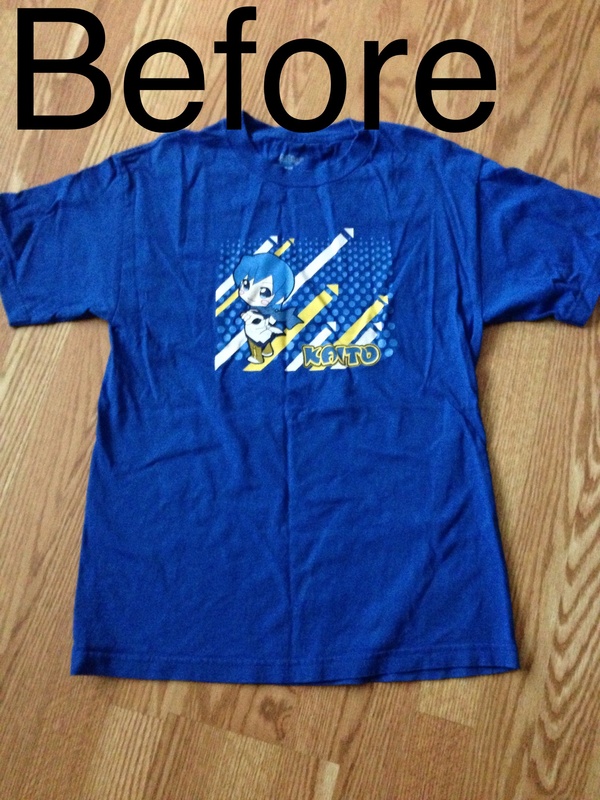 I started with the large tee. I have had this tee since 2011 and wore it a few times for sleeping. I don’t know what possessed me to buy a men’s medium; I haven’t worn oversized shirts this large since I was in high school. It’s been sitting in the closet for a good year and a half. 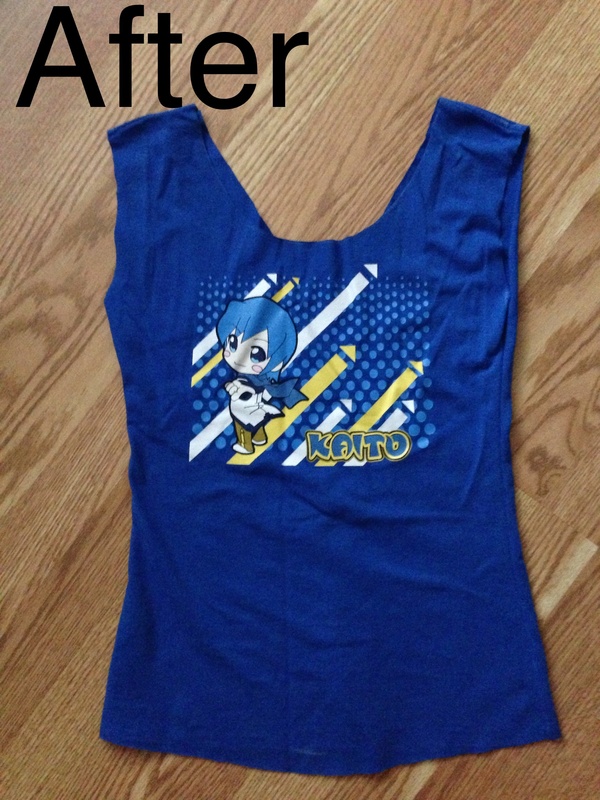 I decided to attempt to make it a racerback tank using various no sew tutorials on Pinterest. I cut the collar down to where I wanted it and cut off the sleeves. Since the sides were too wide, I decided to slim those down about 3 inches on each side. THAT was a mistake since now the tank was fitted and wouldn’t accommodate the racerback style in the way I was making it. So instead I cut a deep V in the back and cut off about 3 inches off the bottom. So it wasn’t what I wanted originally, but it’s still a decent tank and more sized to my body. The edges are raw and after some debate I decided to leave them that way. It’s just for working out/running so it’s going to get filthy and messed up anyway. I told myself I wouldn’t add more cosplays to my list…then I went and added Qarth Daenerys and Margaery. I swore I wouldn’t add more than that…yeah, right. I am late to the fandom, but I finally have jumped on the Firefly/Serenity bandwagon. I had seen the movie but understood little of it since I hadn’t seen the series. I decided to finally watch it on Netflix, if only to understand all the Firefly references that pop up on Castle. Once I watched it…well, cosplay wasn’t a far stretch. 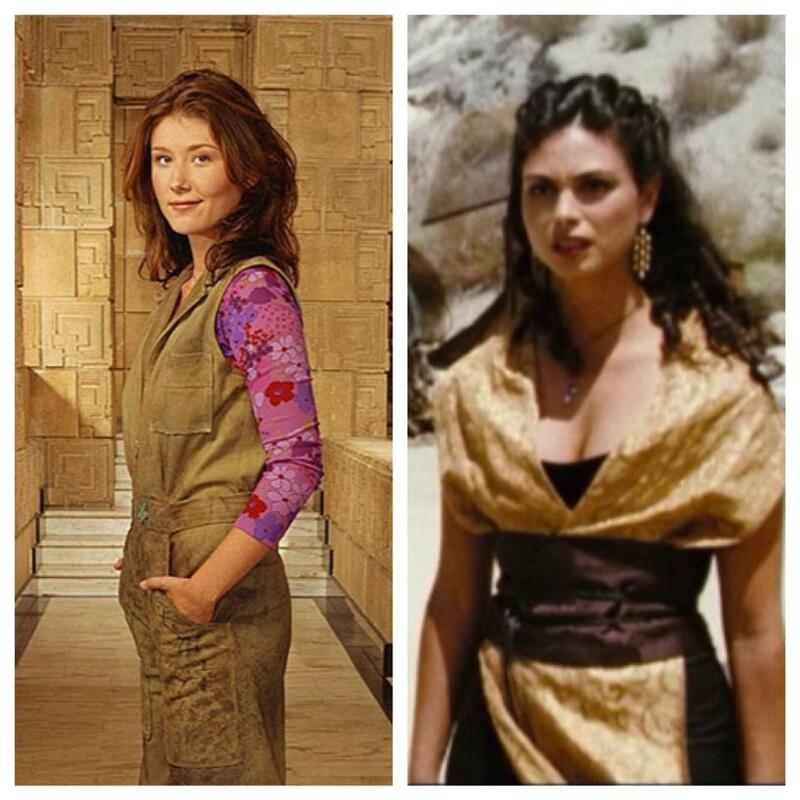 I love all the female characters on Firefly. I love Zoe, Inara, Kaylee, and River all for different reasons. It’s difficult to pick a favorite; I think I’m a toss between Zoe and Inara. Since two of my best friends also love Firefly, I made the executive decision that we were going to cosplay from it. I would have made Shannon be Zoe, but she is not the cosplaying type and would rather be regulated to bag holder. Holley would love to cosplay Firefly but doesn’t sew. So that left me to do all the sewing and wig styling…and I’m okay with that. It was easy to decide on the costume for Holley since her favorite character is Kaylee. But what would I cosplay? Originally I thought of River, but I am too attached to Inara’s pretty costumes…but I had to find one I was comfortable in and didn’t take a lot of research to figure out. I ended up deciding on her gold shawl and black pants combo from the Serenity movie. It was not overly difficult but still elaborate for Inara. Plus I had black sateen, the gold flats (from Daenerys and Margaery) and the black curly wig (from Katniss and Snow). I started with Kaylee, and the first thing I did was to purchase the paper parasol from ThinkGeek. Next was the shirt. It was near impossible to find a decent replica, so I settled on a floral knit with big roses and Deer and Doe’s Plantain pattern. It’s a pretty pattern, but the knit fabric was thin and unraveled very easily. It stretches but then wrinkles when it bounces back. I also somehow managed to sew the front piece backwards but it’s not completely noticeable. The coveralls was a combination pajamas top and bottom modified slightly with a strip of fabric for the waist. There are some pleats in the top part and gathers in the back of the bottom to accommodate a woman’s hips and bust. It’s a bit snug around the back when the arms are flexed around the chest, and a snug at the waist. Neither is uncomfortable, but I keep making these slight mistakes and not knowing how. One day I will learn. My mother actually did all the character writing using a black fabric pen. I distressed the coveralls a little with sandpaper and faded some spots with water and a high steam iron setting. I attempted to stain them with soy sauce, which only worked minimally; going to try later with some watered down black fabric paint. 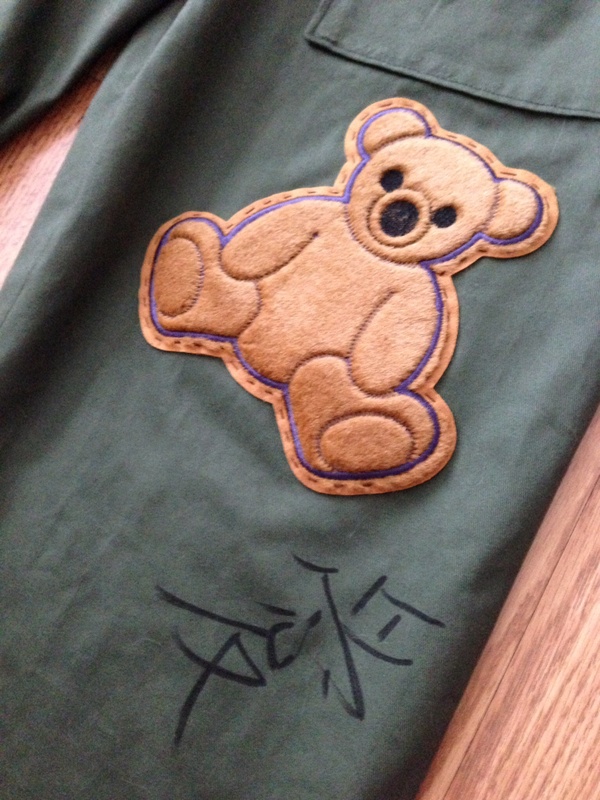 Here’s a close up of the bear patch with the character for love. My mother and I had this somewhat semi-heated argument over the characters. I wanted her to write them at slight angles since Kaylee’s are not exactly straight. However, the manner in which Asian students are taught how to write has them repeatedly write characters in a very straight fashion. I think I ended up confusing her and had to turn the coveralls in the direction I wanted the writing to go. There was also some debate over the characters on Kaylee’s left pocket. It is notoriously known that the characters on the left pocket are backwards/upside down so it didn’t matter if they made sense. I had my mom write the characters for Serenity and paused the DVD so she could see them. She proceeded to grumble about how the characters “don’t go together and make no sense” while writing them to please me. Inara was a bit more simple (not that Kaylee was overly difficult compared to other cosplays I have done). I used a wide legged pants pattern and black sateen. 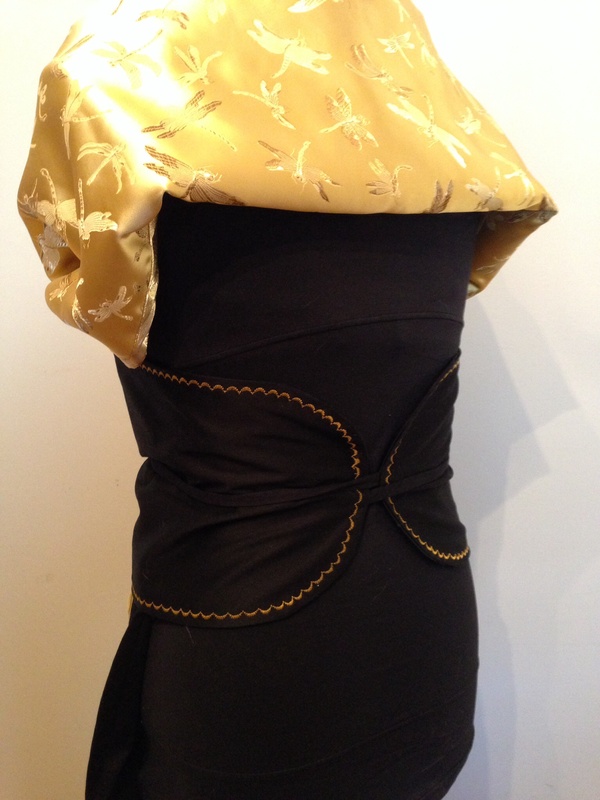 I used more of the black sateen for the faux obi belt which I drafted by draping and cutting; I used a scallop edge stitch in golden yellow to give the plain belt a little oomph. A simple stretch control top cami is underneath as the tank top. The gold shawl/wrap is dragonfly brocade (I could not find swirl brocade but the dragonfly one was gorgeous). 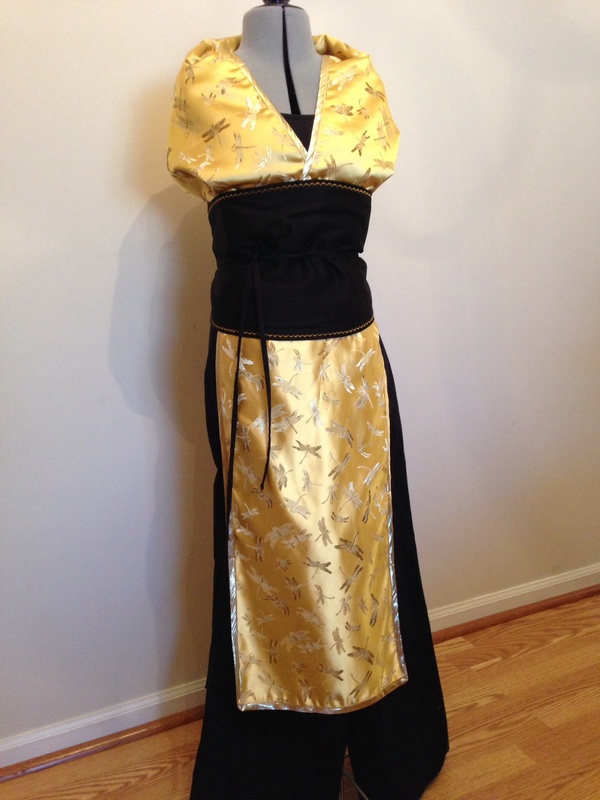 I made it in two pieces: one piece to wrap around the shoulders and then a separate piece for the bottom drape, all sewed to the faux obi and edged in gold lame bias tape. For the record, the shoulder wrap makes NO SENSE. I don’t know what the costume department did for the movie, but it does not lay right. Maybe I made mine too wide or the fabric is a heavier weight, but if I wear it one way I can’t move my arms but another way causes it to bunch around the neck. I mean, look at it! Oh well…at least the “back” is hidden by the hair of the wig. The most difficult thing about Inara was finding jewelry that could work. But I managed to find dangle chandelier earrings and a double drop lariat necklace off Etsy for decent money. Since this outfit of Inara has less make up than some of her others, I am opting for a mostly bare faced look with sparkly taupe eyeshadow, semi-heavy eyeliner, and pink tinted lips. I’ve got a photoshoot in Kaylee to get pictures and figure out any kinks before handing it over to Holley. I’ll probably have another photoshoot with Inara in the near future. These were probably two of the simplest cosplays I have ever made, time and construction wise. All total, I probably only spent about 4 days worth of work on two costumes. But they are going to be so fun, so comfortable, and so worth it to geek out with my friends. I cannot wait! A while ago, Peneloping posted about her Archer shirt. I went to investigate and discovered the pattern is by Grainline Studios. Needing a plaid shirt of my own, I purchased the pattern and set out to turn some red and black flannel into an Archer of my own. Unfortunately the flannel was AWFUL to work with. It mucked up my iron on the low setting and kept shifting in the cutting process. I decided to scrap the project and turned the remnant into a makeshift draft guard for our front door. Still wanting an Archer, I figured a plain shirt might be easier and more versatile. 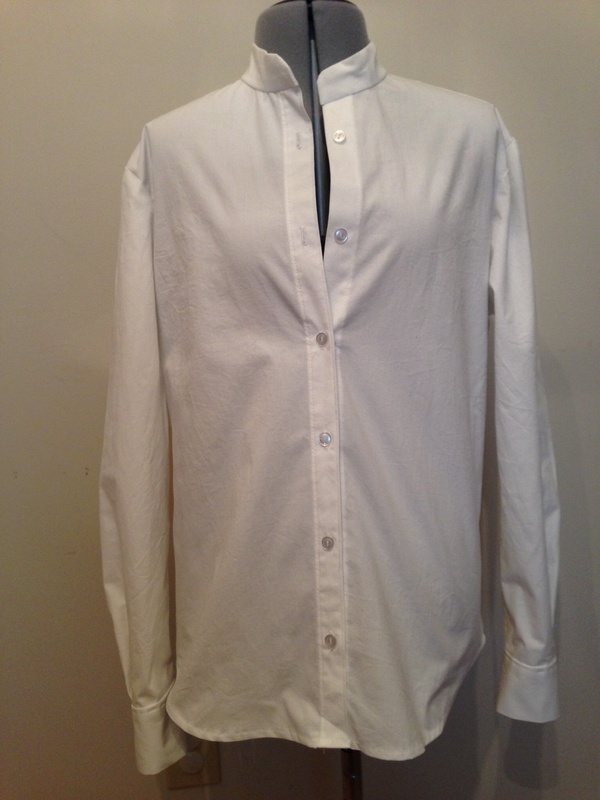 Not much is shown about the shirt except that there is a zipper in the back, it has a mandarin collar, and is long (almost to the knees). The sleeves are rolled/pulled up so no telling if there are cuffs or what kind, and she wears it unbuttoned with plain buttons. Nothing overly special about the shirt, but I adore the zipper in the back. I had to have it. 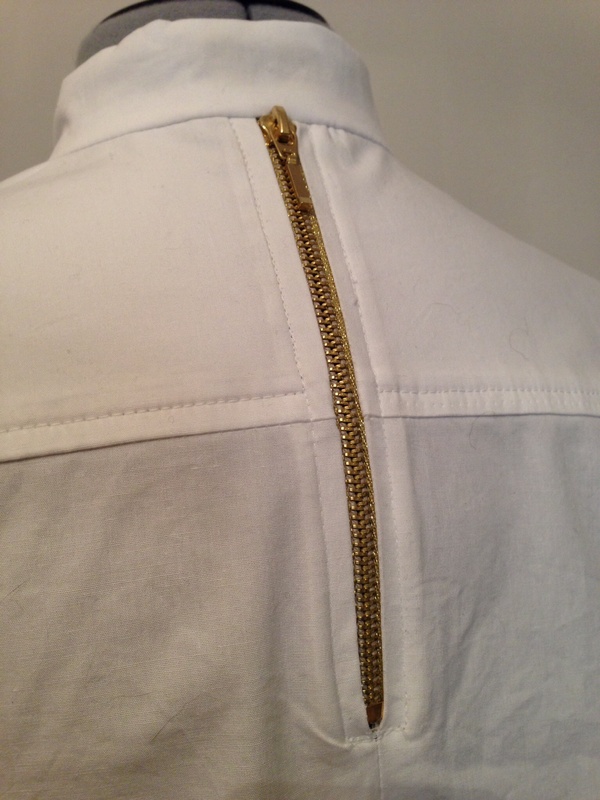 A trip down to my local fabric shop had me purchasing some plain white stretch poplin and a gold metal zipper. I knew I didn’t want the long length of the shirt so I kept the length of the size 2 Archer. I also knew that my personal style meant the cuffs would be rolled up 99% of the time so I wasn’t too concerned if I messed them up. Luckily Grainline gives wonderful instructions with its pattern so figuring out the cuffs and the plackets was easy. 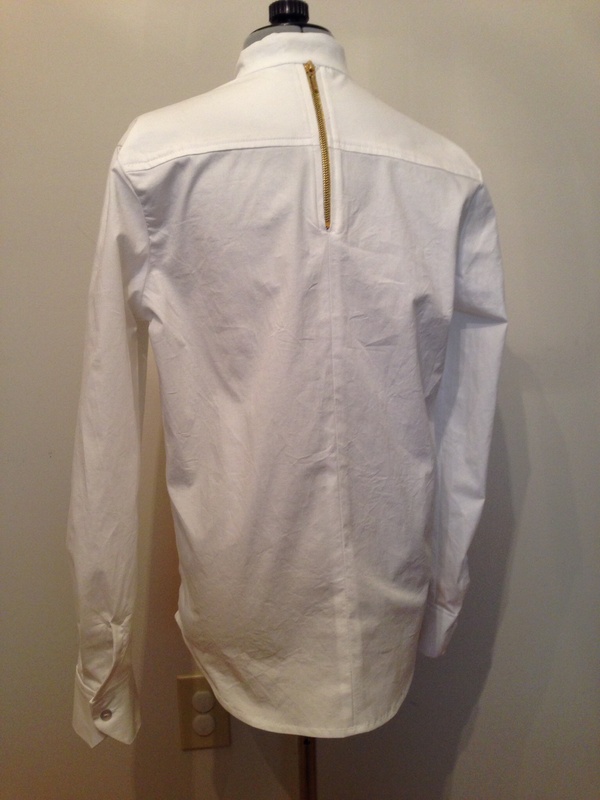 I made a few modifications to the back to accommodate the zipper (omitting the pleat and adding 1/2″ to the yoke to fit the zipper, and omitted the main collar piece. The shirt took me about 6 hours, start to finish. It came out lovely, very simple in the front but then the zipper pops in the back. The zipper is fully functional, but is more decorative than useful as it does nothing but open a gagging hole in the back. I intended this project to be a more “inspired” than “replica” since I have no intention of cosplaying Jamie Moriarty. I wanted this to be a usable piece in my wardrobe with an interesting detail. If someone recognizes it, great but at least I know what inspired the shirt. I find I really enjoy Grainline’s patterns. I want to try their Moss skirt pattern since I have an awful time finding such skirts to fit my hourglass shape. 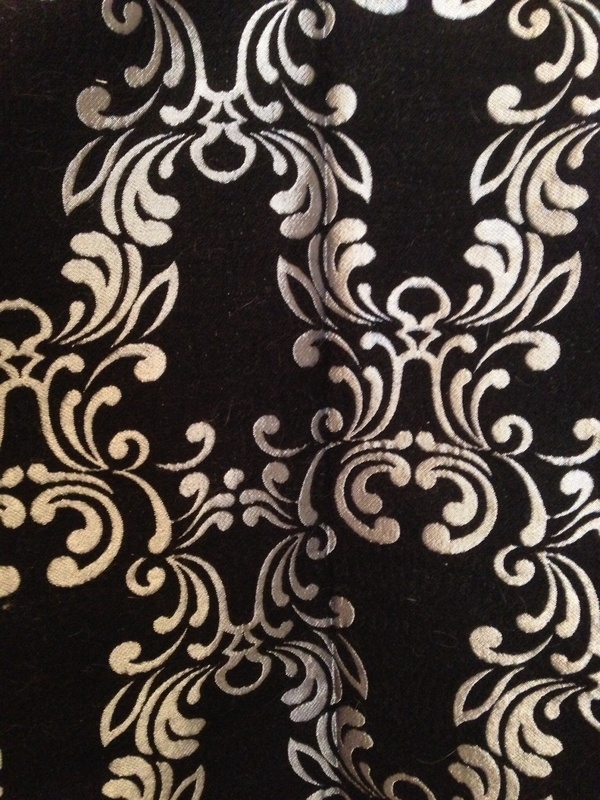 Plus, I found a wonderful black on black embossed corduroy in my search for the poplin I really want to work with. There was this one day I was in the fabric store. I can’t remember what I went to buy, but as I was walking the aisles of fabric bolts I came across this beautiful black and silver reversible brocade. It was calling to me, but it was expensive so I resisted buying it for a few weeks. Eventually I broke down and purchased 1.5 yards not knowing what I was going to do with it. I had the notion to turn it into a skirt but didn’t know what kind. 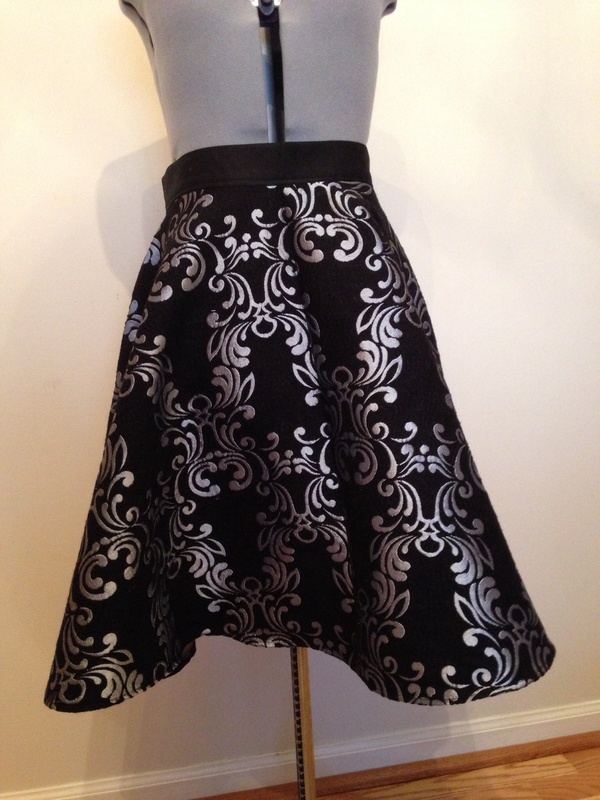 The pattern is quite intricate so the skirt had to be simple. Nothing with pleats or anything fancy. I ended up deciding to turn it into a circle skirt. After searching the web and viewing various tutorials on how to make a circle skirt without a pattern, I decided to give it a try. It took about two hours and just a little bit of fudging but I got it right. 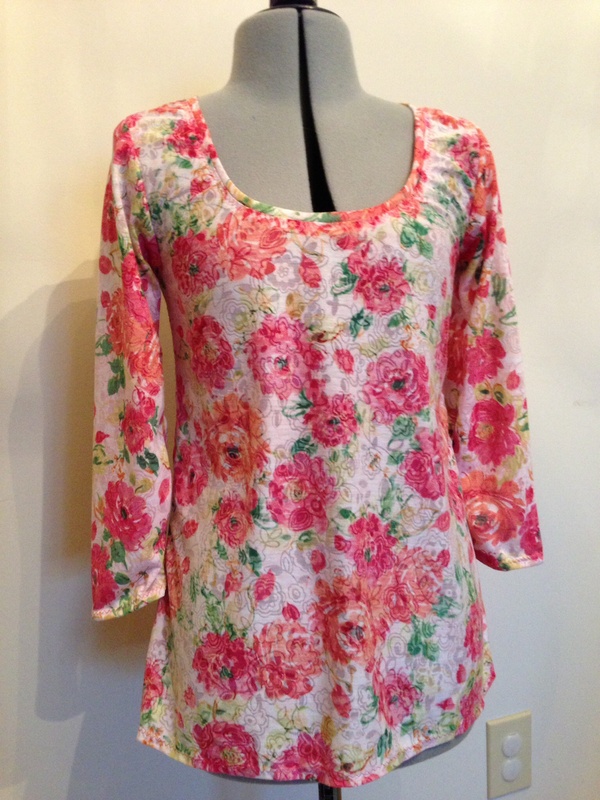 It’s nice and swishing and has a beautiful drape. It is a little fancier than most fabrics or clothes I wear but I think it would be able to spruce up otherwise plain outfits. I didn’t photograph the back but I used an exposed metal zipper as a closure. The brocade is the perfect weight for cool weather, and the color is ideal for fall and winter. It’s just a tad too cold right now to wear it (at least until I find some warm leggings to wear with tights). I bought some stretch fabric last week with the intent of making a floral shirt and two maxi skirts. The two stretch jersey fabrics for my maxi skirts ended up creating a mess on freshly swept floors and not cooperating with me at all; I ended up throwing all 4 yards of scraps into the trash. I hadn’t touched my floral jersey and set it aside, still intending to make my shirt but not wanting to deal with jersey fabric. For the record, I prefer woven fabrics. A dress? Why didn’t I think of that? Immediately thought of April Rhodes’ Staple Dress which I had been drooling over for weeks. I bought the pattern, printed and taped it together; I had the fabric and the serger. The only thing I didn’t have was elastic thread but I have 1/4″ elastic which April says works as a substitute with zig-zag stitching. It took about 3 hours on and off to finish. Since I was working with stretch fabric, I didn’t make the bias tape but twice folded over the edges and zig-zag stitched. I also opted for the high-low hem since that is my current obsession with skirts and dresses. 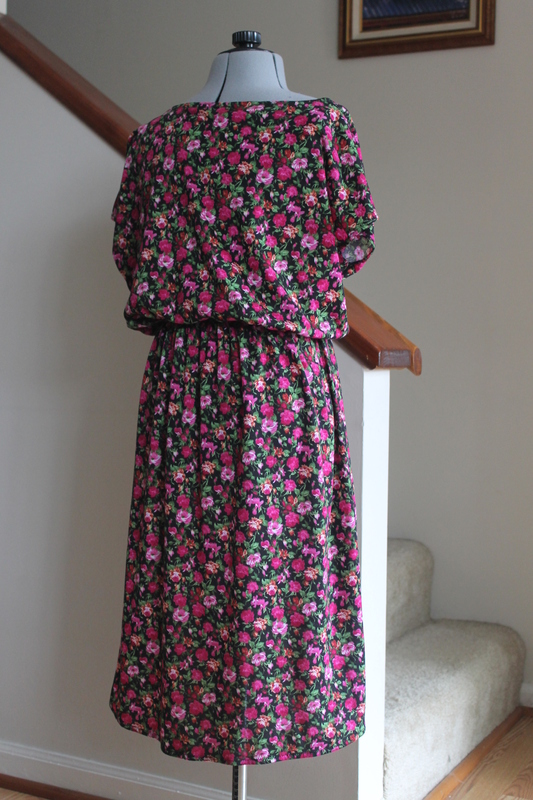 After completing the dress, I highly recommend springing for elastic thread and doing shirring on the waist. The elastic doesn’t make quite an impression gathered, and my zig-zag stitch kept catching the edges (I set it at the widest stitch and it still was smaller in width than the elastic). I will definitely be making this dress again in a variety of fabrics. It’s a very simple pattern and so versatile. The new 12th Doctor was announced yesterday. Welcome aboard, Peter Capaldi! I do not know your work outside of the Fires of Pompeii but I look forward to what you will bring to the series. Every since I heard the announcement that Matt Smith was leaving the series, my mind has been in a whirl. I learned of Doctor Who during David Tennant’s run. I have not yet seen Classic Doctor Who (to be honest, it’s a little slow for my taste), but have seen every episode since it’s revamp in 2005 (thank you Netflix). I thought Tennant was my favorite and first Doctor, but the truth is Smith is. I love his humor and his physicality. I love his interaction with the other characters. And while I understand many people’s dislike of how the show is run under Steven Moffatt’s tenure as head writer, I still like the show. So I am sad to see Matt go. -A messenger bag: I have been wanting to make a messenger bag for a little while now. I’m a student photographer but I don’t always carry my Canon and lenses around with me. Instead I always have my iPhone and Olloclip for when photo opportunities arise; I also have a set of colored plastic filters and want to buy a pocket reflector. But my current handbags are not designed to accommodate all of these items in an organized fashion. Spoonflower has some awesome (but expensive) fabric I want to use in Tardis themed prints. I want to get a yard of specialty fabric and make a handbag with compartments for each of my iPhone accessories. -A Tardis themed skirt: I’ve seen a couple of Tardis themed skirts on Etsy but rather than buy them I want to make one since I’m proficient at sewing. I am just having difficulty finding the correct color. -Refashion Whovian shirt: I bought a gray, junior size medium shirt from Hot Topic that simply says “Whovian” on the front with a mini Tardis over the i. Even in a size medium it’s a little snug around the chest for my taste…and I have a small chest. 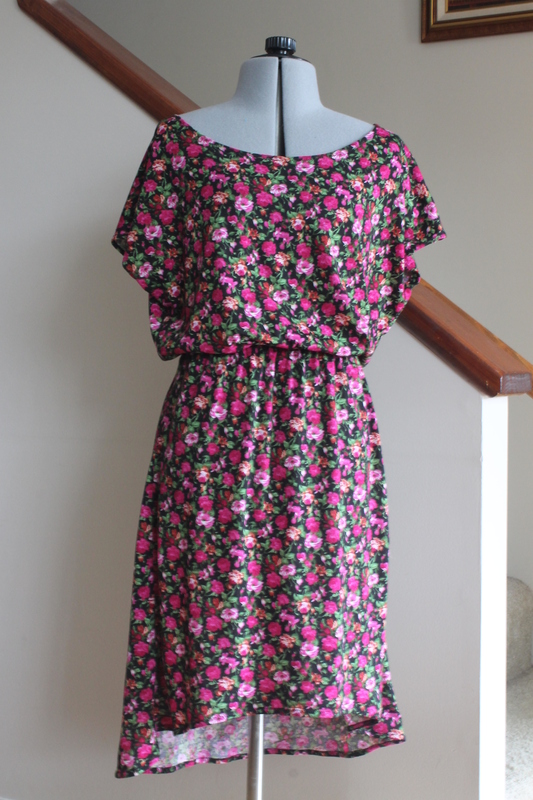 I want to refashion it either with a blue lace back or a more Anthropologie inspired back. -Doctor plush: I haven’t handmade plushies in a while. In fact the only plushie I’ve ever handmade were teddy bears, one of which I gave away as a gift and the other…I have no idea where it is. Anyway, I kind of want my own 11th Doctor to carry around with me when I go to work, out hiking, doing photography, traveling, etc. Michelle Coffee on Etsy has a pretty decently priced pattern I am considering. I can easily modify the colors for my favorite purple frock coat. My hands are itching to stitch this together already. -Doctor and Tardis sneakers: This will probably be my biggest project. I’ve seen a lot of painted Keds/Vans/canvas sneakers inspired by the Tardis as well as the 10th and 11th Doctors’ wardrobes. I am in love with 11th purple frock coat so I’ve been scouring the Keds website for blue and purple sneakers I can paint myself (I want to buy them in colors so I don’t have to paint or dye them). I just need to pony up the money to buy them (I can’t buy cheaper versions because I have wide feet and Keds makes their classic shoes in wide). Of course, I have more Doctor Who cosplays planned. I am planning on a Snowmen Clara barmaid dress for myself, an Idiot’s Lantern Rose outfit for my friend Holley, and a season 7 11 outfit for our mutual friend Jubal but that all depends on funds. These three cosplays wouldn’t be needed until next May so there is still time. And there are my projects. Hope I can get a good number of them done and save some money too.